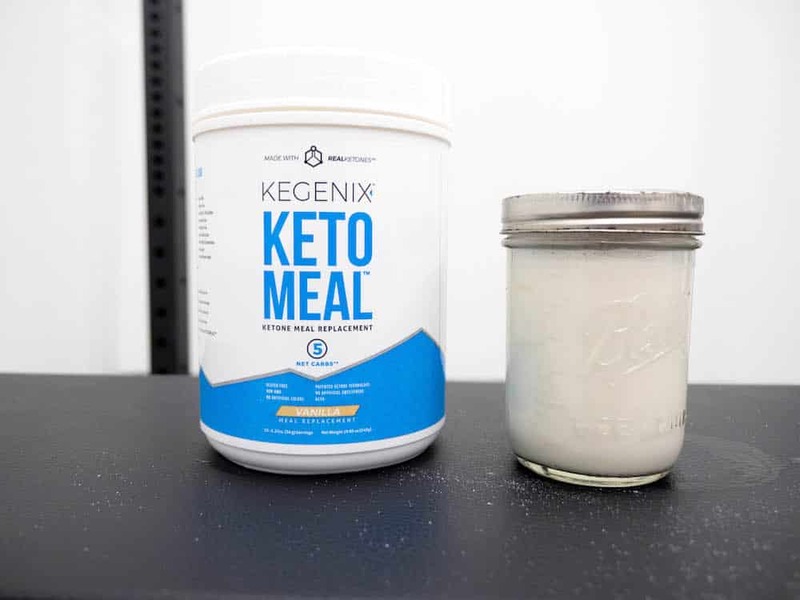 Home » Kegenix Keto Meal Review – What Do Ketones Taste Like? 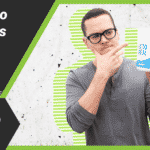 Kegenix Keto Meal Review – What Do Ketones Taste Like? Kegenix is a Florida-based nutrition company that focuses, of course, on the ketogenic diet. 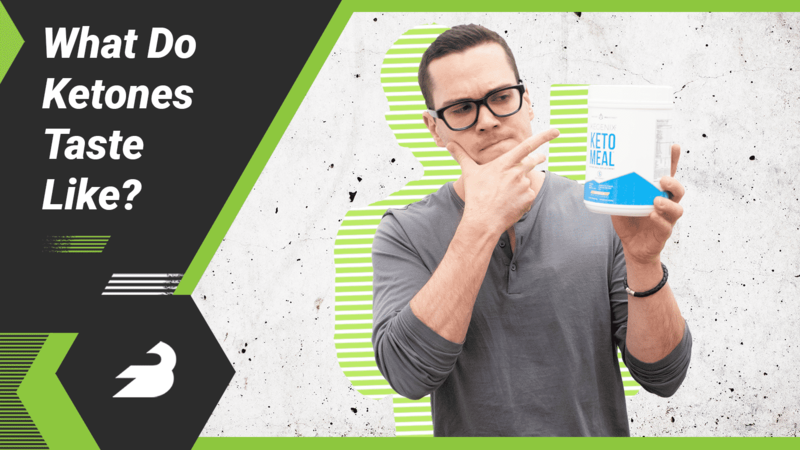 They sell a lot more than just keto-friendly meal replacement powder; there’s also keto-centered vitamin supplements, ketone-laced pre-workout mouth spray, and more. 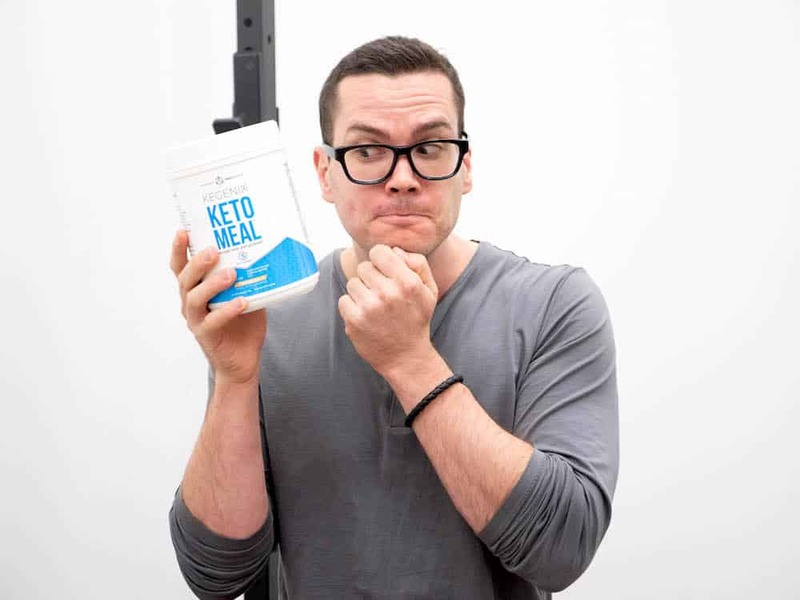 Keto Meal has an interesting advantage in the niche keto supplement industry because they use Dom D’Agostino’s patent from the University of South Florida for exogenous ketones. D’Agostino is a big name in ketosis and fasting circles and these exogenous ketones will be a real plus for some folks — not everyone’s a fan, but there’s a definitely a contingent of keto dieters who are wild about them. It comes in Chocolate and Vanilla, we took a closer look at the Vanilla-flavored Keto Meal. This keto shake stands out among its competitors because it contains exogenous ketones, which may help with energy levels. Use code BARBEND10 to get 10% off your order. One serving is two scoops and contains 150 calories: 10 grams of protein, 8 grams of carbs (3 grams of fiber and no sugar, so 5 grams of net carbs), and 10 grams of fat with 3 grams of saturated fat. As far as micronutrients go, there is about 25 percent of the recommended daily intake of 21 vitamins and minerals, plus about 17 percent of your sodium and 10 percent of your potassium. There’s no choline or chloride, but by and large it’s a pretty nutritious product. The fat comes mostly from sunflower oil and medium chain triglycerides and the protein from whey protein isolate. The other ingredients are sodium caseinate, natural vanilla flavor, sodium beta-hydroxybutyrate, calcium beta-hydroxybutyrate, magnesium beta-hydroxybutyrate, guar gum, salt, sunflower lecithin, organic rebaudioside A (a natural sweetener), the blend of vitamins and minerals, some stevia — technically organic glucosylated steviol glycosides — and silica. 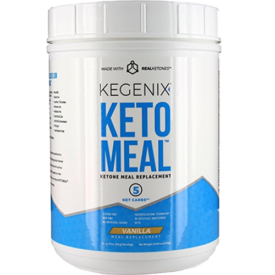 We land on the absolute best keto meal replacements on the market here! 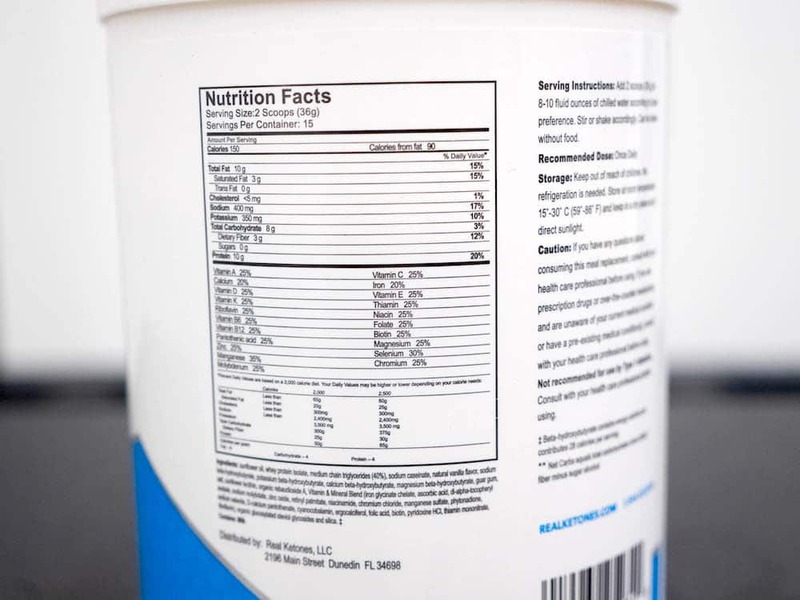 Those beta-hydroxybutyrates in the ingredients list are the exogenous ketones, and BHBs make up to 78 percent of the total ketones in the blood. Without getting too bogged down in the science, the idea is that BHBs help to provide energy when you’re in ketosis. Many folks like ketogenic diets because of the perceived benefits of BHBs, and taking exogenous ketones like the ones present here might be great or unwelcome, depending on your opinion. Some folks in the ketogenic community dislike the idea of taking exogenous ketones because they believe they interfere with lipolysis. We’re not about to say whether or not that’s the case, we’re just pointing out the fact that ketones are in this product in case you’d rather avoid taking them in supplements. Another aspect of this product that might be seen as a pro or a con is the macro split: 10 grams of fat for 10 grams of protein. Now that’s 90 calories of fat for 40 calories of protein, but some people prefer significantly more grams of fat than protein in their keto supplements. Others might like the protein boost. Again, it depends on how you take your supps. In any case, this is a very nutritious product and the micronutrients are on point, plus it’s non-GMO and free from hormones, antibiotics, sugar, and artificial sweeteners. It does contain a little bit of lactose, if you’re extremely sensitive to that it could be an issue. The sunflower oil is also high in omega-6, which could be undesirable depending on your goals. You can pick up a 15-serving tub (which they consider a 15-day supply) for $50, so it’s $3.33 per serving. That’s a little pricy (I’ve seen keto meal replacements for $2), but since Kegenix has those fabled exogenous ketones you may find the price worth it. Ketones are infamous for not tasting amazing, and Keto Meal doesn’t taste amazing. The ketones taste sort of metallic and peaty, which is why despite the lack of artificial sweeteners this product still tastes a little artificial. I’d say it tastes like a vanilla waffle combined with a peaty scotch. This is one of those products where consumers are likely to know what they like before they pick it up. You’re either delighted or disappointed by the ketones, delighted or disappointed by the macros, you care about the lack of artificial sweeteners or you don’t. One thing that’s objective is that the nutrition is solid and it’s pretty low in calories, so it can fit into a variety of ketogenic diet plans.